By Dr. Mannie L. Brodie Jr.
As a Christian I have seen many different things from so-called believers over the last 20 years. Things from failure to ongoing success in Saints that have learned how to apply certain principles that God has established. I am convinced that God is a principle driven God and any believer that will operate in His laws (a systematic way of doing things) will do well in their life and experience what God designed them to do. However, the only way that you will ever do what God planned for your life and receive what God promises you in the Bible is by living by faith. From the Old Testament to the New Testament, God has always made one thing very clear" That the just (or the people that are in right standing with Him) shall live by faith. In Habakkuk 2:4 "Behold the proud his soul is not upright in him; but the just shall live by faith" God said that the just person shall live by faith. Again in Romans 1:17, Galatians 3:11 and in Hebrews 10:38, He (God) is telling us a certain way to live that is acceptable to Him so that He can bless us. Saints, notice He says the just shall live by faith. When you say a person should live a certain way, it implies that this is a consistent way of life" a life style that does not change! Can you see that? Also it tells you that faith is not a quick fix to get you out of problems that your poor or ungodly decisions have caused. It tells us that faith is a lifestyle and we receive the benefits of walking by faith. 2 Corinthians 5:7 "For we walk by faith, not by sight" over a period of time. Can you see that? For example, the Bible tells us in Hebrew 6:12 "that you do not become sluggish, but imitate those who through faith and patience inherit the promises." Notice He said through faith AND (a conjunction linking to things together) patience we inherit the promises. By the Bible using the word patience, it reveals to us that it can take some time for these promises to come to pass. That is why God tells us to live by faith so that our faith can be consistently developed to receive the next level of blessings and promises in our life. Faith is a process and if we do not continue to live by it (faith), our faith will never develop. If it does not develop you will never do or receive what God intends for your life. In Hebrew 12:2 "Looking unto Jesus the author and finisher of our faith; who for the joy that was set before him endured the cross, despising the shame, and is set down at the right hand of the throne of God." Romans 12:3 "For I say, through the grace given to me, to everyone who is among you, not to think of himself more highly than he ought to think, but to think soberly, as God has dealt to each one a measure of faith." Look closely at the last sentence that speaks about the amount of faith you received when you received Jesus as your personal Lord and Savior. He said the measure of faith so that means all of us received the same measure but some saint's faith was developed and others were not. As a result that some saints are living in God's blessings every day and others are being destroyed by the devil. He is taking, stealing and destroying everything they have. Saints, notice He tells the other saints not to think more highly of themselves than they ought. That means others may have thought that they were better then their other brethren. However, he tells them that God has give to them the same measure of faith that He gave you. However he (the other brethren) did not know or his faith has not been developed. If your brethren ever learned how to develop his faith, he will do just as good as your or better. The only reason some Christians receive more than others is because they have more knowledge and wisdom of God in developing their faith, so it is always working for them and bringing the benefits of Gods' Word in their life. Remember it is through faith and patience we receive the promises of God (Hebrew 6:12). This is a standard God has set for His people. God is no respecter of persons (Acts 10:34). Whatever He does for one He will do for the other. However, you need to do what that man did to get what he got. For instance when I saw how God had blessed others and how they became blessed, I was convinced that if I would be faithful to God and obey His word He would do it for me. So I started to imitate those (Hebrews 6:12) who through faith and patience inherited the promises. I started making faith confessions; I started to change my negative confessions into positive confessions by saying or always being in agreement with the word of God. I started calling those things that are not (seen) as though they were seen (Romans 4:17). When I started operating by faith, Hebrews 11:1 "Now faith is the substance of things hoped for, the evidence of things not seen." Then my faith started to develop and grow and I started to receive the promises manifesting in my life. GLORY TO GOD! I believe there are basically three reasons why God wants us to live by faith. First, if I do not live by faith, I cannot please God. (Hebrew 11.6 "But without faith it is impossible to please him: for he that cometh to God must believe that he is, and that he is a rewarder of them that diligently seek him). The reason I cannot please Him is because I cannot receive my salvation or receive the promises that He has given to me as a descendant of Abraham (Galatians 3:29), unless I receive it by faith. Ephesians 2:8 "For by grace you have been saved through faith, and that not of yourselves; it is the gift of God." Faith is what you must go through to receive your salvation from God. You must believe that Jesus Christ was crucified, buried and risen and is presently sitting at the right hand of God (Romans 10:9). Saints if you don't have faith in that, you are not saved. You must believe Jesus has been raised from the dead. Glory to God! We serve a living Savior (Jesus). If you are not saved, you are in the same category as the sinner (someone without God), and no unbelievers will see God or go to heaven. Next, I believe the other reason that God wants us to live and operate in faith is so that we will be able to tap into His power to fulfill and receive what He has for us in this life. In 1 Corinthians 2:4-5, "And my speech and my preaching were not with persuasive words of human wisdom, but in demonstration of the Spirit and of power, 5 that your faith should not be in the wisdom of men but in the power of God." Saints living by faith allows us to tap into God's power and produce the things God has promised us to do and receive. In Hebrews 11:27-35, God reveals how all these miraculous things happen in the lives of the Saints that walked by faith in His Words. 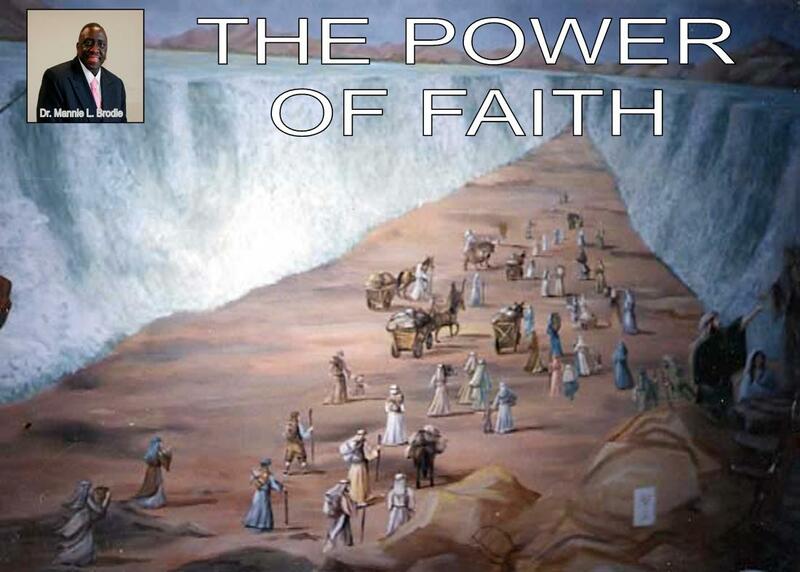 From Moses to David and the Prophets each one of them had to use faith to tap into God's power. If they did not believe Him and operate by faith they would have never seen God's power manifested in their lives. If Gideon did not obey God and go to war with the Midian Nation with only 300 men they would have never won. Likewise, if Joshua had not walked around those big walls of Jericho for seven days and then yelled, those walls would not of came down, (Joshua 6:15-17, 20). Also Moses and the parting of the red sea, if he did not count God faithful by acting on His (God's) Word, they would have never escaped Pharaoh's soldiers. Saints always remember on of the ways that you tap into God's miraculous power is by faith. In Galatians 3:5. Paul asked a question: "Therefore He who supplies the Spirit to you and works miracles among you, does He do it by the works of the law, or by the hearing of faith?" The miracles come because you and I believe that God is a miracle working God. Bless God! Finally the last one is for us to receive our covenant promises that God has promised us in His Word. In Hebrews 6:12, the Bible tells us it is through faith and patience we receive God's promises. Always remember faith in God is always based on His Word. So when you are in faith you are standing on a promise God has spoken or written in His Word and God will always confirm His word (not our words, unless it is lining up with His) with signs following. Mark 16:20 "And they went out and preached everywhere, the Lord working with them and confirming the word through the accompanying signs. Amen." So in conclusion, I would recommend that you operate and live by faith so you will be able to do and receive more from God in your life. Then you can be a blessing to your family members, friends, associates and others. Dr. Mannie L. Brodie Jr.
God bless you for this sermon text on faith. Amen!